The light dimmer circuit or fan regulator circuit (either case, the circuit and design are the same, only difference is the output load to be varied, that is, fan or light) is used to control the brightness of the light or the speed of the fan according to our desire. The objective of the circuit is to vary in intensity the brightness of the light bulb or fan speed by using a fixed source. There is no need to replace the bulb with a higher wattage one to do so. A simple Triac can do the work for you. Triacs are used in this circuit as a dimmer as they are easy to design and control, and are very much economic due to their high efficiency and low buying costs. 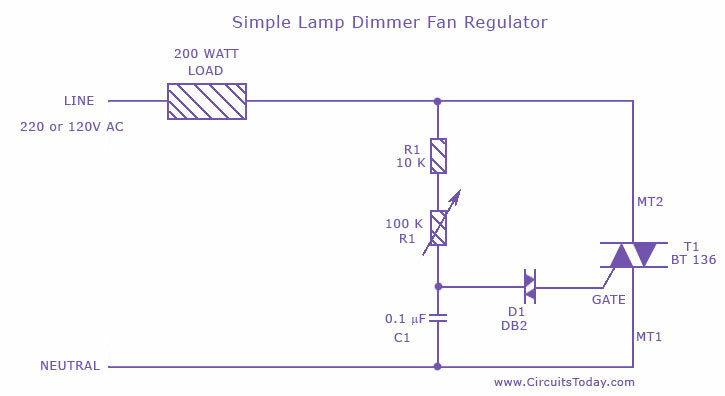 This is the circuit diagram of the simplest lamp dimmer or fan regulator. The circuit is based on the principle of power control using a Triac. The circuit works by varying the firing angle of the Triac . Resistors R1, R2 and capacitor C2 are associated with this. The firing angle can be varied by varying the value of any of these components. Here R1 is selected as the variable element. By varying the value of R1 the firing angle of Triac changes (in simple words, how much time should Triac conduct) changes. This directly varies the load power, since load is driven by Triac. The firing pulses are given to the gate of Triac T1 using Diac D1. Assemble the circuit on a good quality PCB or common board. The load whether lamp, fan or any thing should be less than 200 Watts. To connect higher loads replace the Triac BT 136 with a higher Watt capacity Triac. All parts of the circuit are active with potential shock hazard.So be careful. I advice to test the circuit with a low voltage supply (say 12V or 24V AC) and a small load (a same volt bulb), before connecting the circuit to mains. The light dimmer circuit explained above has been modified with the addition of a snubber circuit to improve the performance of the Triac. A fuse is also added to the circuit. what is the estimated cost of single phase ac voltage regulator using diac and triac? how to connect variable resistance (potentiometer)????? May i get the relevant waveforms for the firing angle of 60 degrees? please…. Is it possible to turn this to be automatic light dimmer, for example,substituting that potentiometer with LDR? How this circuit will be interfaced with PIC16F877? Can you please give me the information about how this circuit will be interfaced with PIC16F877? It helped me alot in my project. It really works so good!! Thanks!! please help me to control the speed of AC 220v motor 1HP, can i use this circuit with just changing the triac with higher one? Hello sir please can u send me the total documentation of the temperature controlled fan using triac, diac, thermistor. Please send me totally as early as posiible. I will be waiting for your reply. we are yet to try it.. hope it works ! Hi Nohammed Saad The same circuit can be used if it is mains operated LED appeared on Circuits today. If it is DC operated then you can use a variable current source using LM317 or MOSFET. i would like to control a dc load like LED s what do you recommend for me?? i want to design light dimmer circuit.lamp brightness will be controlled based on already existing brightness in room.give information about sensor i have to use. I m a 4th year student of EEE department and i m looking 4 project based on automatic temperature controlled circuit. So i choose automatic temperature controlled fan regulator. 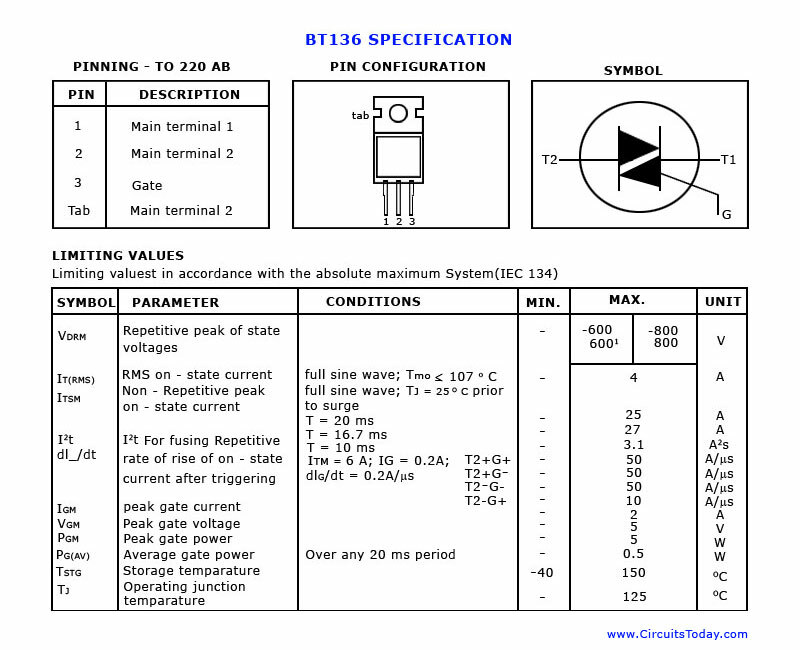 I need of details about this circuit……….. Here is the circuit you asked. May i use any other number in the place of BT136? I would like to connect higher load like 3000watt filament lamp,pls. recommend me the appropriate triac with proper circuit to avoid potential shock hazards.